No, not your hangover. Red wine headaches take many forms. One glass of wine, and you wake up with a "cold-like" headache... two glasses of wine, and you wake up with a migraine. Sometimes a red wine headache can start just minutes after your first few sips. If you have had any degree of a red wine headache, this is article is for you. When many people think of red wine headaches, they jump to sulfites as the cause. Those who experience a wine headache assume they have an intolerance to sulfites or are even allergic. In response, they may try to avoid sulfite-heavy wines -- go organic, search for bottles without a sulfites warning, or God-forbid, stop drinking wine. 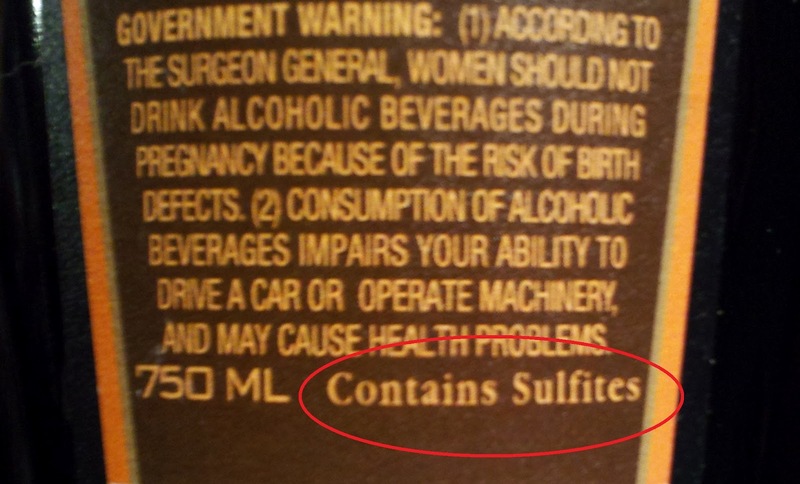 They all contain sulfites... even if the bottle lacks this phrase. But sulfites are probably not your problem. Well, I'm here to be your hero... kind of... sulfites are probably not your problem. 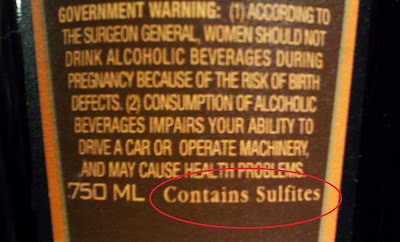 In fact, if you're searching for a sulfite-free wine, good luck. During the fermentation process, wine yeasts produce sulfer dioxide, making it a 100% impossibility to produce a sulfite-free wine. However, if you are medically proven to have a sulfite sensitivity, you should probably avoid lunch meat, processed fruit juice, packaged seafood, dried fruits, and yes, wine. Don't worry... it's estimated to affect less than 1% of the American population, according to the FDA. Even though sulfites aren't the answer (99% likely), I want to share a quick fact I discovered from Alison Crowe's The Winemaker's Answer Book: "Many people mistakenly assume that red wines contain higher levels of sulfites than white wines. The opposite is actually the case, because most winemakers add more sulfer dioxide to white wines than to reds. White wines need more protection from oxygen than red wines do, and sulfer dioxide acts as an antioxident." So what really causes a red wine headache? Well, it is still a puzzling question, but there are several possible answers, and to be honest, it may be a personal connection to one of these that may help you. In smaller, less-biology-classed words, the chemical process that produces wine creates histamines. If you are generally sensitive to allergens (pollen, mold, etc.) and you frequently get red wine headaches, it may behoove you to try an antihistamine medication before you know you're going to enjoy a glass of wine. Please make sure it is safe to combine the medication with moderate alcohol consumption first. Even more so than histamine, tyramine may be the culprit. This excerpt from Wikipedia is very helpful in understanding the role tyramine plays: "Dr. Lynn Gretowski, co-founder of WineDoctors.com, states that... 'tyramine is thought to be a vassal active substance that causes the dilation and contraction of blood vessels - the squeezing and relaxation component of headaches.' She goes on to say that younger wines and wines that have not been extensively racked or filtered will tend to have higher rates of tyramine." Not that I am advocating the use of over-the-counter medication while drinking wine, but if you are prone to red wine headaches and you are going to enjoy in moderation, I would suggest taking an anti-inflammatory medication like Ibuprofen in the correct dose prior to your wine consumption. Don't take acetaminophen (Tylenol) -- alcohol may be bad for your liver in high doses, but the combination of acetaminophen and alcohol in small doses can be devastating to your liver. Tannins: It is theorized that tannins may cause headaches. "Tannins tend to bind starches while being digested. These starches are needed by the body to produce serotonin. In some people who are extremely sensitive to their serotonin levels, it appears the lack of serotonin can lead to [headaches]. It sort of 'starves' the body for this type of raw material, as much as not eating for many hours might lead this person to have the same [headache]." (www.wineintro.com) If this is the case, you may simply have a sensitivity to tannins. To disprove that you do have this sensitivity, sample a strong black tea. If you receive the same headache that you would from drinking red wine, then you may unfortunately have a sensitivity to tannins, and there isn't much else to do but grin and bear it... because the only other option is to not drink wine, and that simply will not do! Oh wait... you could drink white wine! The bottom line: you must experiment to see how your body reacts to the many varieties of wine on the market. If all red wine gives you a headache, and you cannot face the pain again, try white wines. If it is a concentration factor, try a lighter-bodied red wine - a Pinot Noir for example - opposed to a full-bodied Cabernet. As I tell everyone who asks: "wine is very personal... you have to enjoy what's right for you!"